Top Ten New Species: Snub-Nosed Monkey, Devil Worm, More. Video — World’s Deadliest Scorpion? — National Geographic. Scorpions are gross. 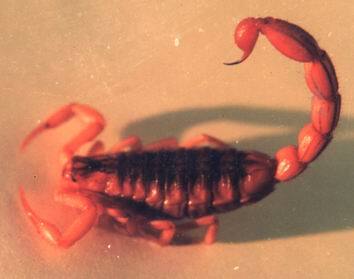 This one, the Indian Red scorpion, is 50-90mm of “don’t tick me off”. Children are the most frequent victims of this arachnid. The cardiovascular and pulmonary systems are most affected by the venom. New “Albino” Spider Found in Australia. No matter how gross, trapdoor spiders are pretty interesting. Recently, we’ve had several animals come in to the hospital that have been COVERED in fleas. My first thought is usually “Time to bust out the Siphotrol” (a chemical that kills adult fleas and ticks, and also prevents eggs and larvae from developing). Then, it’s “Crap, my animals at home.” There are few things more disgusting than restraining an animal that has those little buggers hopping and crawling over them (besides maybe draining an abscess, but it’s not really rewarding). Leaves you feeling itchy for most of the day afterward. Blech. The flea belongs the to order Siphonaptera. These include wingless insects with specialized mouthparts used for piercing skin and sucking blood. The most abundant species of flea is Ctenocephalides felis (which might explain why we’ve had so many cats in with fleas). 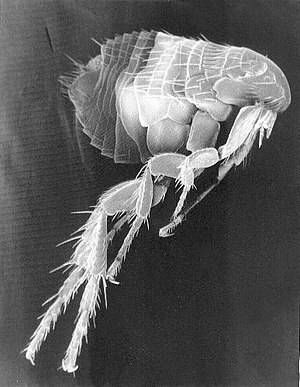 While fleas have species names reflecting a primary host (eg. C. felis, C. canis, Pulex irritans), they can reside on other hosts. For instance, C. felis is a major culprit of flea infestation in dogs and humans can be affected by species besides P. irritans. Flea Bite Allergy (or flea allergy dermatitis) is the development of hypersensitivity and possible lesions and itchiness in reaction to salivary antigens. In dogs, the allergy is most common at age 3 to 5 but can develop at any age. Cats have no common age range. Treatment involves eradicating the flea infestation and alleviating discomfort the animal is experiencing. Côté, Etienne. Clinical Veterinary Advisor : Dogs and Cats. 2nd. St. Louis: Mosby, Inc., 2011. Print.